→ Old Ox is a Winner! Old Ox brewers have gone over to the wild side! They have created another spectacular Funky Face brew that explores the tart and sour side of craft beer. The newest member of the Old Ox Funky Face Family is a Dry Hopped Mango Sour—kettle soured for a clean tartness. Post fermentation additions of Galaxy Hops and mango create a magical tropical fruit flavor that perfectly personifies the tart character of Funky Face II. How sour is it? FF Mango is somewhere between 6 and 7 on the tart-o-meter—with 10 going to the extreme. The pureed mango is added post-fermentation to preserve the mango flavor and aroma. Galaxy hops are in short supply, so when our brewers saw these hops appear on the secondary market, they … er…hopped on it! Lively and fresh…FF Mango’s acidity and fruitiness is likely to attract wine drinkers over to the beery side of the adult beverage spectrum. Brewers use a variety of approaches to souring beer, but we used kettle souring for this beer because we like the clean flavor. Kettle souring uses the same brew process used for traditional beers until the hot wort reaches the boil kettle. At this point, the wort is cooled to 100-115 degrees. The brewer adds lactobacillus (yep, bacteria) and holds the temperature for up to 48 hours. The lacto works its magic, dropping the pH (for those of you for whom chemistry is a dim and distant memory: the lower the pH, the higher the acidity and acidity=sour). Once the desired pH level is reached, the wort is brought to a full boil, killing the lacto (whew! I bet you were relieved to hear that!) and halting any further drop in the pH level. Where and When can I get my hands on this?! 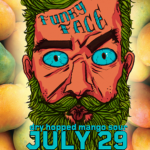 Our Funky Face Dry Hopped Mango Sour will be available on tap in our tasting room for a very limited amount of time starting Friday, July 29th and in 22-oz bottles (limit 2 per person) and on draft at a limited number of establishments.